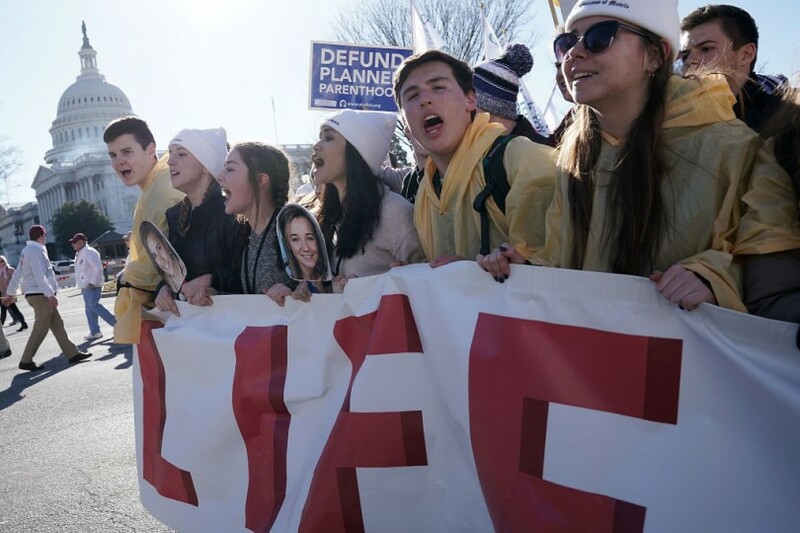 Pro-life activists participate in the 2018 March for Life as they pass in front of the U.S. Capitol. James Gallant, a retired emergency physician who serves pro bono as the medical director of the Hope Life Center in Sterling, Illinois, a crisis pregnancy center, doesn’t offer abortions, and doesn’t want to tell women who visit his facility that they can get them elsewhere. Doing so — which is required under a 2016 state law — would violate Gallant’s religious freedom, he says. Earlier this month the Thomas More Society, a pro-life nonprofit law firm, filed a federal complaint on his behalf with President Donald Trump’s Department of Health and Human Services. In the complaint, the firm claims this requirement flies in the face of federal laws that exempt health care providers from participating in abortions if they claim a religious objection. But far more than Gallant’s conscience could be at stake. He maintains that federal funding for health and safety net programs for Illinois residents is contingent on the protection of his wall-to-wall conscience rights. Although they have never been applied so broadly, federal conscience protection laws may allow for this radical application, according to legal experts — and it’s up to a bevy of sympathetic bureaucrats Trump has installed at HHS to decide. If Gallant prevails, Illinois could lose federal funding for a whole range of social welfare services, from Medicare and Medicaid to food stamps, welfare, and Head Start — all because one man didn’t want to tell women where they can obtain abortions. Roger Severino previously ran the DeVos Center for Religion and Civil Society at the conservative Heritage Foundation. He now leads Trump's Office for Civil Rights. Rather than protect citizens’ freedom of religion, civil rights attorneys argue that Severino’s new division could herald a reversal in civil rights gains. Since Trump’s election, the OCR has seen 34 complaints, compared to the 10 during the Obama years. On Jan. 9, the Family Research Council put out an action alert to its followers, urging them to file their own complaints with OCR. Gallant’s is just one of a rush of similar complaints HHS has received since Trump’s election. Under President Obama, the department received only a handful of complaints citing federal conscience protection laws. These laws include the 1973 Church Amendment, which requires federally funded health care facilities to allow providers to opt out of participating in abortion, sterilization or other procedures to which they have religious or moral objections; the 1996 Coats-Snow Amendment, which extends those protections to medical students and residents; and the 2004 Weldon Amendment, which extends these conscience exemptions related to abortion to a broader range of “health care entities.” Obama’s HHS infuriated conservative lawmakers and activists because — they maintained — it was slow to act on those complaints, or closed investigations without finding violations. But the complaint procedure, managed by HHS’ Office for Civil Rights, is now controlled by Trump political appointees who want to more vigorously enforce conscience protection laws, and who are actively seeking more complaints. A year ago, Gallant’s complaint would have been a non-starter; now it will receive a sympathetic, if not enthusiastic, hearing. The Illinois law Gallant objects to is an amendment to the Health Care Right of Conscience Act, a 1998 law that exempts health care providers in the state from having to perform abortions or other reproductive health procedures they say violate their consciences. But the law produced some unintended consequences. Some Catholic hospitals refused to provide care to women who were miscarrying even when the patient’s health was at risk and the fetus would not survive. The Illinois legislature, under a Democratic majority, passed the referral requirement in 2016 to protect patients’ timely access to care. Lorie Chaiten, director of the Reproductive Rights Project at the ACLU of Illinois, called the amendment a big step forward for Illinois women; no longer would they “need to worry that they are being denied medical information based on their health care provider’s religious beliefs.” Under the amended law, objectors like Gallant may still opt out from performing procedures they morally object to; they are simply required to refer the patient to another facility. Anti-abortion medical doctors, crisis pregnancy centers, and Christian right advocacy groups swiftly condemned the amendment as a fresh attempt to discriminate against them for their religious beliefs. Within days, Alliance Defending Freedom — the legal powerhouse that recently argued Masterpiece Cakeshop v. Colorado Civil Rights Commission before the Supreme Court — filed suit against the amendment, arguing it violated the constitutional rights of doctors and crisis pregnancy centers. In July 2017, both state and federal courts entered preliminary injunctions, barring the state, for now, from enforcing the law. Now Gallant, and other like-minded doctors, have extended this challenge to HHS — hoping to put much of the federal funding for their states at risk. At HHS, the Office for Civil Rights is charged with enforcing anti-discrimination laws, health privacy laws, and conscience laws, and protecting access to health care for vulnerable groups. Over the past year, Trump has stacked that office with a legion of anti-abortion rights activists who share the belief that the conscience rights of conservative Christians are under siege by laws protecting access to health care for women and trans people ― and that conscience protections should become an OCR priority. Christian rights activists are still seething over their frustration with how Obama’s OCR handled such complaints. During the final Obama years, the head of the office was Jocelyn Samuels, a seasoned civil rights attorney who had come from the Civil Rights Division at the Department of Justice. She was running the show when three complaints arrived from a group of California churches and other Christian institutions, charging that the State of California had violated the Weldon Amendment when it reminded insurance companies of their obligation under California law to cover abortion procedures. One of the complaints was brought by Casey Mattox and Matthew Bowman, then both attorneys at Alliance Defending Freedom (ADF), together with an attorney from the Life Legal Defense Foundation. Because the health insurers themselves had no objection to offering the coverage, Samuels found no Weldon violation, and closed the investigation in June 2016. Bowman, Mattox’s co-counsel on the case, is now deputy general counsel at HHS, where part of his job is providing legal advice to OCR. At the helm of Trump’s OCR is Roger Severino, who previously ran the DeVos Center for Religion and Civil Society at the conservative Heritage Foundation. At Heritage, Severino wrote frequently in defense of conscience clauses and specifically derided actions taken by Obama’s OCR. He also attacked an Obama-era regulation that protects transgender people from discrimination in health care as a threat to religious conscience. Enforcement of that regulation is now his responsibility at OCR. But Christian right activists saw Severino’s history as an asset. In their view, the Obama administration had a distorted approach to combating discrimination, focused on protecting women’s reproductive choices and health care access for trans people. Severino now had an opportunity to focus OCR enforcement on what they saw as the real threat: efforts to curtail the religious freedom of health care providers. Once installed, Severino hired staff from leading Christian rights organizations with track records advocating for religious protections for people who oppose abortion and LGBTQ rights. For chief of staff, he hired March Bell, whose previous appointments included serving as staff director and chief counsel for the Select Investigative Panel on Infant Lives, an investigative committee House Republicans launched in 2015 in the wake of the release of deceptive Planned Parenthood videos by the Center for Medical Progress. The committee’s goal, in the words of its chair, Marsha Blackburn, was to guarantee that “not one cent of taxpayer money” goes to “big abortion businesses.” Severino brought on Justin Butterfield as a senior adviser; Butterfield had been senior counsel at First Liberty Institute, an anti-LGBTQ law firm based in Texas who helped prepare a report last fall, provided to President Trump, Vice President Mike Pence and members of Congress, that claimed to document 1,400 religious liberty violations over the past year. Severino has brought on other conservative activists on a contract basis, including Mandi Ancalle, a veteran activist with a detailed understanding of the Christian right’s wish list for the Trump administration. Ancalle, who went from being general counsel for government affairs at the Family Research Council to being a contract policy advisor at OCR, told the Values Voters Summit in September 2016 that she was “working to generate a comprehensive list” of policy priorities for a potential Trump administration that included reviving a Bush-era conscience rule, rescinded by Obama, that exempted health care workers from treating women, LGBTQ people or others based on religious objections. At the summit, Ancalle reiterated the Christian right’s opposition to Obama-era regulations protecting transgender patients from discrimination in health care, according to a report on the gathering by People for the American Way, a progressive advocacy organization. The hiring blitz is still underway. OCR is currently seeking an attorney advisor to work on matters concerning “free exercise of religion, conscience protections, and protections against certain kinds of coercion or religious discrimination.” HHS did not respond to a request for comment about OCR hiring. The social conservatives Trump hired at HHS’ civil rights office have moved quickly to transform the organization. On Jan. 18, Severino announced the creation of a new Conscience and Religious Freedom Division at OCR. In remarks in the department’s Great Hall to an audience of some 150 HHS staffers and selected guests, Severino took aim at his predecessors and promised an entirely new political culture in the agency. HHS, Severino told the appreciative audience, “has not always been the best keeper” of religious liberty. But “times are changing,” he said, at the agency and beyond. “We’re institutionalizing a change in the culture of government, beginning with HHS, to never forget that religious freedom is primary freedom, that it is a civil right that deserves complete enforcement and respect.” And he touted how the new division will expand the office’s enforcement of federal laws — particularly the Church and Weldon amendments invoked in Gallant’s complaint. The flood of complaints appears to be part of a concerted effort to take advantage of Severino’s tenure at OCR: On Jan. 9, the Family Research Council, a national Christian rights advocacy group, put out an action alert to its followers, urging them to file their own complaints with OCR. “For eight years, former President Obama’s administration turned a blind eye to these injustices, despite numerous federal laws protecting pro-life conscience rights,” wrote David Christensen, the organization’s vice president for governmental affairs. “To stop these injustices, President Trump’s administration needs pro-life Americans who have been directly harmed to file a complaint with the Department of Health and Human Services’ (HHS) Office of Civil Rights (OCR).” The email then offered a tutorial on how to file a complaint. Last week, HHS published a federal notice officially establishing the new division and made public its proposed regulations. The notice describes sweeping powers, beyond the scope of Weldon, Church, and Coats-Snow, to conduct “nationwide enforcements” and to provide “conscience and religious freedom technical assistance” to everyone from federal staff to health care providers, religious organizations, nonprofits, and state and local governments. Illinois and other states whose funding could be at stake can take some comfort in the fact that OCR isn’t the final arbiter of these complaints. Even if Gallant and the others were to prevail in that office, their cases would likely be litigated in court, Fogel said. But social conservatives are engaged in a pincer move: If a plaintiff like Gallant prevails in court, Fogel said, that could have a “chilling effect” on states that consider laws like Illinois’ that protect access to reproductive health care. If a plaintiff like Gallant loses in court, proponents of conscience exemptions would likely use that as evidence that Church and Weldon are insufficient and that Congress needs to pass a more vigorous law. “I don’t think there is any question that this is politically motivated to push the Congress” to expand federal conscience protections, Fogel said. House Speaker Paul Ryan has lent his support to one such bill, the Conscience Protection Act, which was introduced in 2016 and reintroduced last year. The measure would give health care providers like Gallant the right to sue for damages, including from a governmental entity, in court. The bill is seen by its proponents as a more robust remedy than the current options: filing a complaint at OCR or seeking a court injunction. It also puts Christians’ grievances on par with those of protected classes, who can already sue over discrimination for damages and attorneys’ fees. But rather than protect citizens’ freedom of religion, civil rights attorneys argue that Severino’s new division could herald a reversal in civil rights gains. The new division appears to be designed “to prioritize defending the rights of health care professionals to deny care” rather than “focusing on the goals of the civil rights laws to expand access to health coverage and to eliminate barriers for vulnerable people, communities that have been subjected to discrimination over time,” Samuels, Severino’s predecessor, said in an interview. Yet Severino and his allies portray themselves as the true civil rights heroes. At the Jan. 18 rollout, which took place just days after Martin Luther King, Jr., Day, Severino and others invoked King’s legacy to support their claim that people who oppose abortion or LGBTQ rights on religious grounds are the real victims of discrimination. Rep. Kevin McCarthy (R-Ca.) one of three Republican lawmakers in attendance, accused the Obama administration of engaging in a “silent refusal to defend our rights” and praised Severino’s new division.